A Realtor’s brand is more than just a pretty logo and a catchy slogan. Successful Realtors brand themselves like branding is a full time job. I know I’ve just made branding sound pretty overwhelming, but I’ll show you just how easy branding can be in just a little bit. As a real estate agent, you are responding to emails as soon as you wake up, you are prospecting in the morning, you are texting during lunch, you are showing properties in the afternoon, you are networking at dinner, you are researching at night, and firing off the last emails of the day right before you go to sleep. So when is there time for “branding” when it is already a full time job to just be a Realtor? 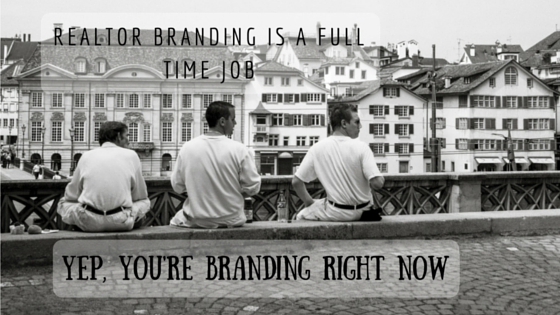 Here’s the good news: branding takes no additional time. Each one of those interactions during a Realtor’s day is an opportunity to brand. And it’s easier than you think. My wife and I recently stayed at a Holiday Inn hotel in Downtown Atlanta. Sure, the accommodations were pretty average, but the hotel nailed their brand. Realtors often say their brand is one thing, but don’t execute on that promise with the experience they provide. The Holiday Inn’s slogan is “We put a smile back on your face.” They actually do a poor job of publicizing their slogan, and their website is more about making the reservation transaction process as easy as possible. The Holiday Inn’s slogan should be front and center, but that’s not really the point I’m trying to make. So what does “We put a smile back on your face” mean? My first instinct is that they think traveling is such a chore that travelers will be happy when they arrive at their hotel, which is hopefully a Holiday Inn. Or that the employees (the “we” part) go the extra mile to please their guests. Or that the whole process of searching for a hotel makes people so frustrated, that they will be happy with Holiday Inn’s reservation process. The Holiday Inn Atlanta Downtown at Centennial Park is a very average hotel. It is so average that Yelp reviewers give it 2.5 out of 5 stars. You can’t get any more average than that! The rooms were a bit dated, and a lot of the furniture was chipped. The small room could only fit a full size bed. Some of the paint in the bathroom was peeling back from the moisture. They even charged us for one night of valet, even though we didn’t even have a car during our entire three night stay. The experience was about the employees. How did the employees put a smile back on our face? The little things…all the little things. It was the waitresses at the buffet breakfast who remembered us and what we ordered to drink after just one day. It was the valet employees who told us to enjoy our day every time we left and welcomed us back upon our return. And we didn’t even bring a car! It was the front desk employees who appeared genuinely happy to see every guest whenever someone walked by, and they always asked if there was anything they could do to help. It was the employee who was on his way to take his break, but said hi and asked me how my day was going even though he was “off the clock”. It was even the woman cleaning the lobby who engaged me to let me know that the simple fact that I pushed my chair in when I left the table made her happy. Do you know how much it means when someone tells you that you did something so small that made them happy? Every employee at the hotel had a great attitude. Everyone said hi to us. Everyone appeared as though they loved working there. Everyone made us feel special. And that was at a Holiday Inn! Why did the employees at the Holiday Inn Atlanta Downtown provide such great customer service? Well, there are several reasons this could be. The promise of the Holiday Inn brand. The reasons don’t matter, because it resulted in those employees strengthening our perception of the brand that Holiday Inn promised. Real estate agents provide their own brand identity, not the brokerage. Real estate agents interact with a lot of people every day. And that interaction is typically with people in their local market. Every one of these interactions that a Realtor has is an opportunity for the Realtor to establish and strengthen their brand. For example, if the Realtor’s brand is knowledge about the community, then they need to prove they know the obvious important facts as well as the minor trivia and interesting anecdotes about many of the neighborhoods. If the Realtor’s brand is about helping clients, then they need to help everyone they encounter with any small thing, no matter how seemingly insignificant. If the Realtor’s brand is about professionalism, then it might not be a good idea to yell at the referees at their son’s soccer game. However, if the brand is about aggressiveness, then argue with refs until they reverse the call! Most of these interactions with the Realtor are local. It’s true that most of the interactions will be with people who aren’t in need of a Realtor or with people who the agent may never see again. But the Holiday Inn continues to put a smile back on someone’s face even if they just need directions, or to use their restroom, or grab a drink at the bar. Also, a real estate agent rarely knows if the person they encounter is someone who is in need of a Realtor or if they know someone who needs a Realtor. And people could be observing the interactions. That person could writes about it in a blog for the story to be read by others (like yours truly is doing about the Holiday Inn Atlanta Downtown Atlanta at Centennial Park). At the Holiday Inn® Atlanta Downtown hotel, we proudly offer a friendly staff and convenient location in the heart of it all. Conclusion: They nailed it. They advertise friendly staff, and their staff exceeds the description. Their staff put a smile back on my face. They Holiday Inn Atlanta Downtown delivered on the promise of their brand. As a Realtor, how do you advertise your brand? Do you execute on that brand promise?